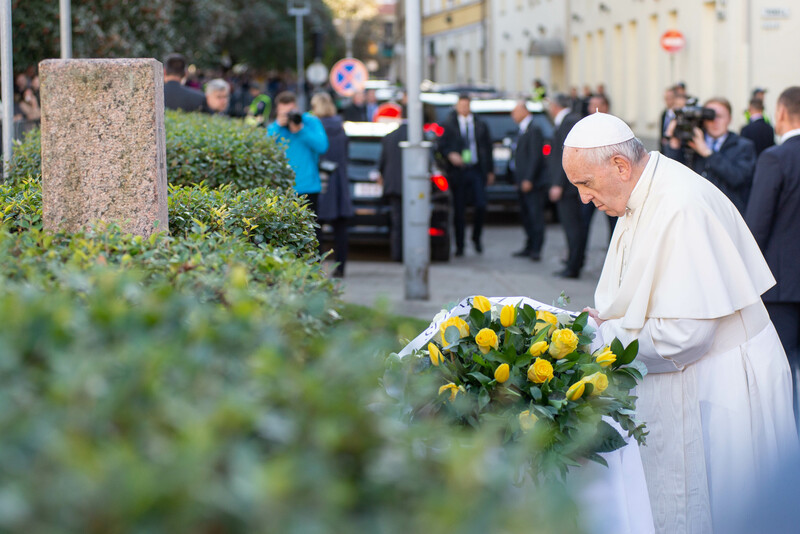 Pope Francis, who is on a two-day visit to Lithuania, today stopped to pray in the territory of the capital city’s historic Vilnius ghetto to pay tribute to the victims of the Holocaust in the Baltic country. Approximately 95 percent of Lithuania’s Jews perished during the Holocaust. The Pope was joined by representatives of the Lithuanian Jewish Community in the Old Town of Vilnius, at a monument to those killed. Also present were Lithuanian President Dalia Grybauskaitė, Lithuanian Bishops’ Conference President Archbishop Gintaras Grušas, and the chairwoman of the Lithuanian Jewish community Faina Kukliansky. From the 15th century until World War II, Lithuania was home to a large Jewish community which was a vibrant centre of Yiddish language, literature and culture. Statistics for 1941 put the country’s total Jewish population at 208,000. It is a birthplace of many world-famous Litvaks, including politicians, artists and entrepreneurs. Today in Lithuania there are Jewish communities in Vilnius, Kaunas, Klaipėda, Šiauliai, Utena, Panevėžys, Ukmergė and Švenčionys, with about 90 surviving synagogues spread around the country.